Foam From Above: NEW PRODUCT: Paper Shooters! I caught wind of Paper Shooters on twitter and instagram, they seemed interesting enough. Behold, a triggered paper wad shooter! 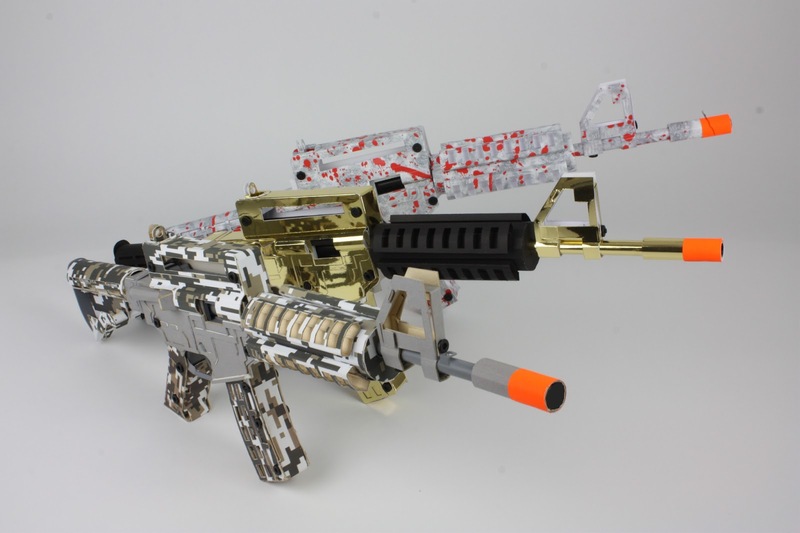 While the paper wad part brought back memories of the Shadow Hawk/Max Force line, they looked like replica M4 rifles and had a trigger... not to mention these things were supposedly made out of cardboard. You know the motto around these parts, "If you can fire it, I will try it." Right off the bat, this line isn't fully in production yet. On Friday, their indiegogo page goes live - www.indiegogo.com/papershooters - and from there you can pre-order your own shooter kit. As stated in the video, they need to cover some further costs on die-cutting parts of the kits so that's where the donations come in. "Everything is included in the box. It uses screws and a patented 'rivet' ststem. An ordinary rivet cannot be opened when fixed but the ones utilsed in our kits can. We include a tool so you can 'un pop' them and change the skins, pieces etc. Glue/ screwdriver etc all included!" Anyone else love unlocking the "Golden Gun" in Goldeneye on the N64? Requires to be set inside a casing, THEN placed inside the magazine. First, this isn't the typical fare of shooter/blaster we're used to seeing. These are construction kits moreso than a toy (think like making a model plane) where the end product is a replica (of sorts) of an m4 rifle. But this actually has a function and shoots projectiles. In this case, wet paper wads. The experience of building is the sell before target practice. If you mod your toy blasters, you know what I'm talking about. The kit is your starting ground. You have the option to build your blaster from the ground up (albeit being handed the pieces), craft your own ammo with the mould included, and customize as more pieces are available. I'm not sure this qualifies as a blaster toy. It's a creative experience first, followed by the play. Additionally, it's geared to 14+, NOT within the usual range of 8+ like most of the other blasters I write about (I believe BlasterPro was aged 14+ as well.) I'd qualify these as a type of display piece/model, that you can play with. While these are modeled after an actual firearm, they are scaled smaller(like an airsoft rifle might be), have the visible orange tip, and colored in atypical designs. While they do fire, the rate of fire is slow compared to current toy blasters (bolt-action, no slam fire, it uses casings to hold the paper wads which eject after each shot, etc.) good for some hijinks in the office and target practice but until I get these in-hand I can't attest to the actual experience of these in use. Between the casings and the rate of fire, it is at a distinct disadvantage for most of the ways I play dart tag. The base of the model is plastic but then decorated and finished off with the cardboard accents. Word has it the cardboard on the exterior will be treated specially to make it more durable than regular cardboard. Again, should I get my hands on these I'll test for sure. Pricing - admittedly $50-$60 is a bit steep, but when you think that buying additional paper wad ammo packs isn't necessary (you can make your own from scrap paper, but additional magazines and casings will be available), that's one thing you save on, and you get a very nice looking replica you made yourself. AND A HUMAN ZOMBIE HEAD TARGET MADE FROM THE BOX. But in this case, the value is all on what you're into. This is an interesting level of customization and 'smithing right out of the box in regards to Things That Shoot, so I'm intrigued to say the least. So you build your own shooter, then what? If the indiegogo does well, they have plans for an RPG, "Call of Duty"-type crossbow, additional sights and accessories, and stronger internal mechs and springs to add to your models after some time. So, you start with these and then continue to upgrade as pieces are made available. This only happens though if they have enough support! When the page goes live Friday, if this seems right up your alley, go for it. www.indiegogo.com/papershooters It looks great aesthetically, and the creative process of crafting your own shooter and ammo (from paper scraps, no FBR or additional materials necessary) might interest you creative types. Give them a look, and if they get to their pre-order target I'll hopefully be back with a proper live test/review of these things when they're available.